Save SAR 13 (61.90%) – Earn 1 Shukran What is Shukran? Shukran is the Landmark Group’s award-winning loyalty programme in the Middle East, which allows you to earn Shukrans when you shop any of our brands. 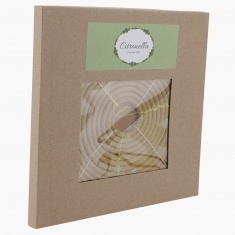 Spread a wave of refreshing fragrance by getting this citronella incense coil. This coil comes with a metal holder which makes it extremely easy and convenient to use.